An electric composter is a lot like a couples counselor. In a healthy relationship, the cast-off scraps of little battles are thrown into the pile, where time begets a natural heat, slowly turning the parts of the relationship that don't work into something from which better things can grow. But when the relationship isn't working right—when the pile just can't make enough heat on its own to break down the thorns—sometimes it seems feels like you need professional help. I moved to Oregon to be with Carmela a few months ago after an overwhelmingly wonderful courtship. Romance is its own sort of special fire, bright enough to blind. But it wasn't a relationship. Not until I moved here, to Eugene, a sleepy college town, where I rented a beautiful home with a yard big enough for a garden. That's when real life began. Soon after I moved here last spring, I started my first compost pile. It wasn't much. Just a Tupperware tub with some holes drilled in the bottom. I'd store up food scraps in a plastic tub in the fridge, then take them out every week or so and toss them into the bin. Sometimes my compost bucket would eat up all the scraps in just a few days, turning them into a nearly black, crumbly mess. Every once in a while it would be too wet and I'd have to throw a straw or leaves in to balance it out. The NatureMill PRO XE indoor composter was delivered a few weeks ago, right around the time that Carmela and I first went to the counselor. It's the new model, which has a stronger, more efficient motor and heater that makes it possible to make mincemeat out of anything—even meat (or mince). This will save a step, I thought. No more caching food scraps indoors for a weekly dump; I'd just toss bits in as I was preparing food. But an indoor composter doesn't work out so ideally in practice. Not because the NatureMill is hard to use—you can flip up the styrofoam lid at any point and toss in more scraps, although you should give them at least a day to get mashed in—but because even when I'd gotten the required sawdust, baking soda, and scraps mixed in healthy balance, it would still fill my kitchen with the strong odor of turbocharged decay. And when the balance wasn't right, just a few seconds with the top popped could be nearly overpowering. I'm not terribly sensitive to the odor of compost or even trash, but there are times when one would rather not have to smell it. Like when making dinner, for instance. So my scrap collecting returned to the plastic tub, stored until after dinner was over. Dumping the finished compost was as simple as pressing a button and waiting about 20 minutes while the S-shaped arm pushed the compost from the hopper into a simple terra cotta-colored plastic bin below. The entire house filled with the vaguely sexual smell of composted food. I was left with a brown lump of stuff that was indistinguishable from its original form—a good sign. 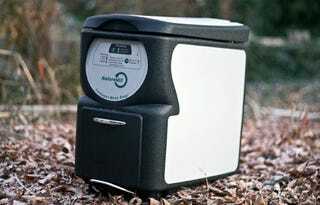 As compost from the machine is still relatively fresh, NatureMill recommends putting it outside to cure. I plomped the steaming goop onto my garden, now covered in leaves and tattered corn stalks, where I hope it will seep into the soil for next year, even if it's looking increasingly likely that I won't be here to plant it. We'd been having problems pretty much since I had arrived. Problems that we'd try to till under, give time to decompose on their own, but which would invariably insinuate themselves back into our relationship with the sweet smell of decay. The counselor was our best chance, we thought. We needed outside help, some extra heat. It turned out to be too much heat. We barely made it through a single session before the counselor told us we should just break up, that we weren't going to be able to turn the relationship into something fecund and sustaining. We got into the car, stunned, and drove home to surrender. There's a place for the NatureMill, I think. And I mean besides outside in your garage. The ability to turn things like meat or even pet waste into compost is something that regular old compost piles just can't—or at least shouldn't, bacterially—do. If you're the sort that wants to turn every last scrap of waste back into your garden, I don't know of a better option. It's also entirely possible that one could get the smell more under control, especially by avoiding the composting of meat or dairy products. But for most people, especially people with the outdoor space for a compost pile or bin, it might be better to save the four hundred dollars for something else. The NatureMill, with its smells and noises and need to be washed down occasionally—not to mention the trouble that will come when one eventually runs out of the little sawdust pellets they provide—isn't easier than doing it the old-fashioned way. It's an industrial machine for a primeval process. And it works. Works very well. But I think sometimes it might be better to let nature take its course, push everything under a pile out of sight, and pretend the whole world always smells sweet.